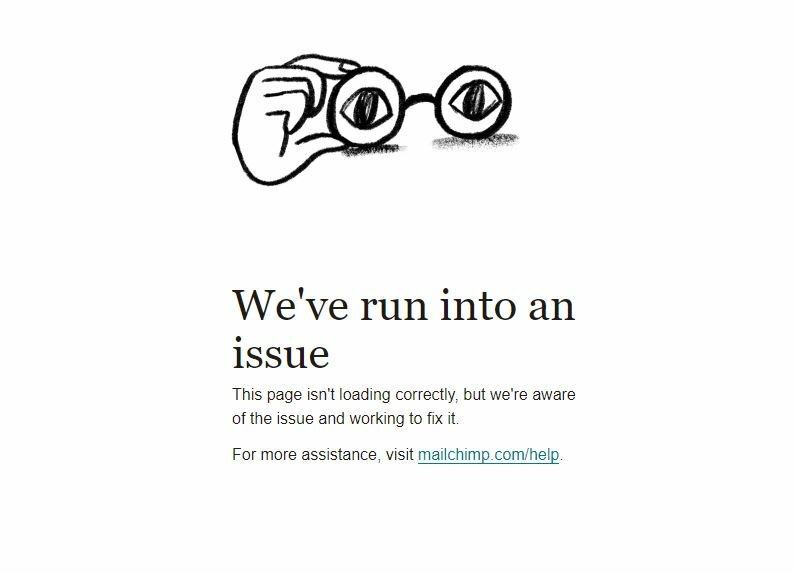 Is MailChimp Down Right Now? @Mailchimp I’m having troubles getting Mailchimp api to connect to my blog - keep getting list not found or not connected - any ideas? @Mailchimp I need tech support please. @MailchimpStatus Are you guys down? My account says it is "under maintenance". What does that mean? @MailchimpStatus @Mailchimp Getting error to please check the delivery checklist? Can you help? @Mailchimp Hi! I upgraded to a paid plan today but still cannot contact support. What do I do? Has anyone been having issues with their MailChimp account? @MailchimpStatus Server seems really slow in UK - keep getting time out messages. @Mailchimp Is there a more appropriate place to request support? I have a question or an issue that needs to be solved. Looks like Mailchimp is down. @Mailchimp and I can't even contact support. Gchat and Mailchimp are both having issues today. Is 4/1/2019 the real Y2K? Anyone having problems logging into @Mailchimp tonight? @MailchimpStatus are there issues with outbound emails right now? Whatever was wrong with MailChimp has been fixed. I'll be sending out my newsletter soon.